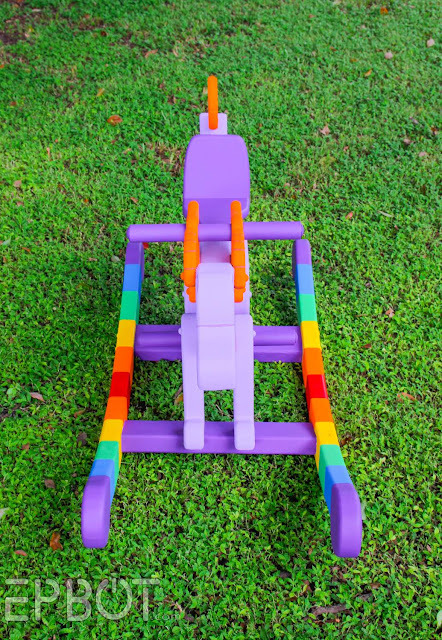 EPBOT: We Made A Figment Rocking Horse! Er... Rocking Dragon? 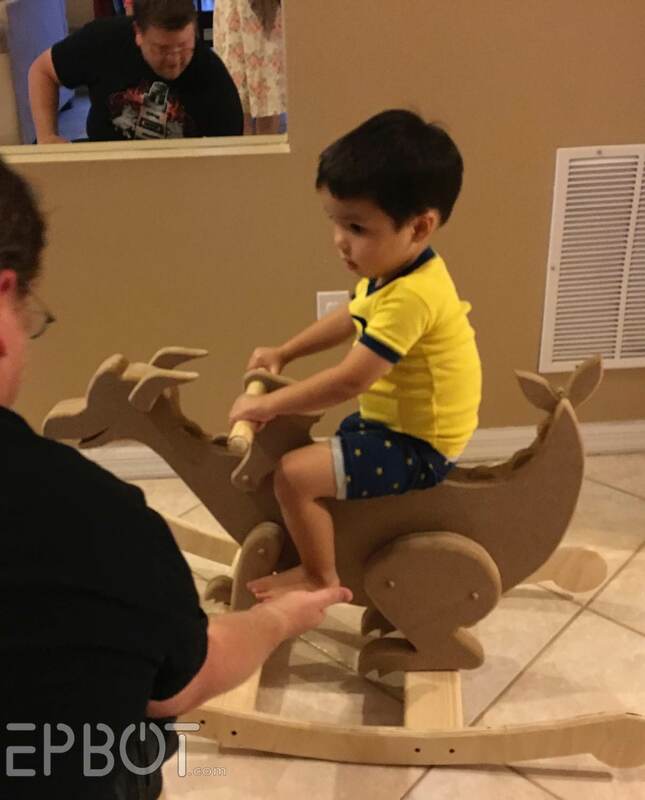 We Made A Figment Rocking Horse! Er... Rocking Dragon? After John knocked out that Death Star shelf last month in just 2 days, he decided to take on another quick little woodworking project. Over two grueling weeks later, and our "quick," not-so-little project is finally - FINALLY - done. It's more of a prototype, really, since of course we realized all sorts of ways to improve and speed up the process *after* the fact, but it's done and cute and delightfully rainbow-licious and did I mention it's finally done? Next we figured out the layers and thickness so I could make all the paper templates. ... and sent John out to the garage to start cutting. He also went on to add sturdier, wider MDF rails. 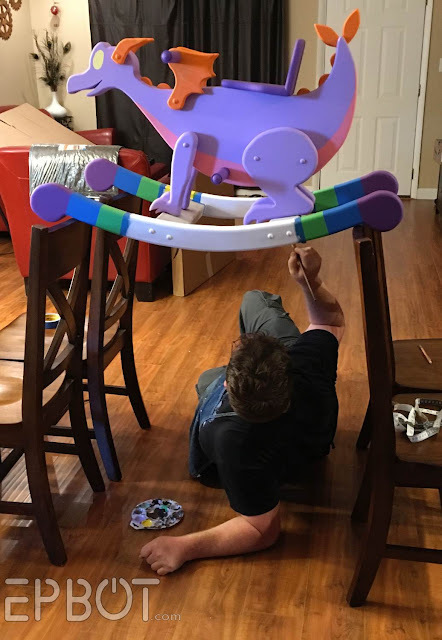 At this point we figured we were pretty much done, because back then we were young and naive and thought painting the rocker would be a breeze. Suffice to say that paint job would go on to inspire a lot of "imaginative" cursing on my part, and I rage quit at least... let's see... twice? There's also the issue of MDF edges swelling and getting insanely rough after the first coat of primer, requiring all the sanding. All of it. After priming, much sanding, and a little more priming. With his help I dove back in, and after another two hard days, countless coats, and lots and lots of taping, the painting was done. Taping off the pink belly stripes. 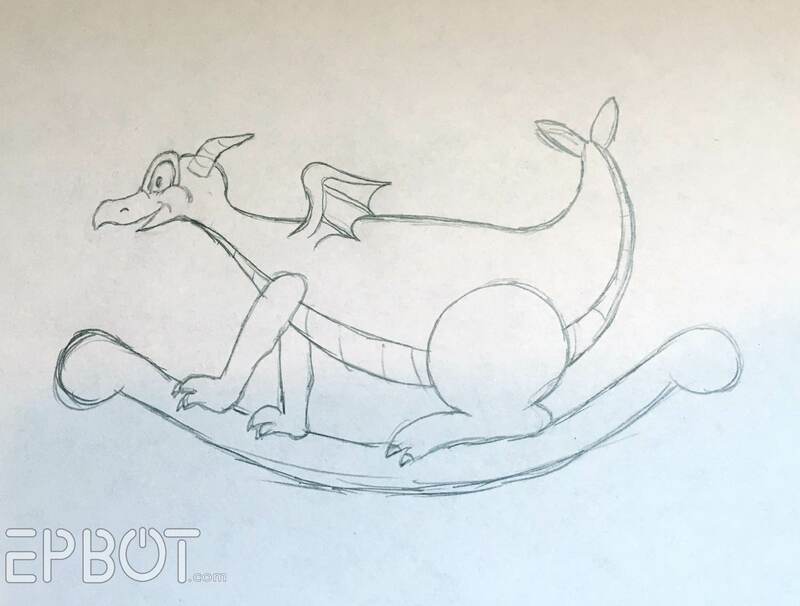 I have Figment looking back to make him a bit more life-like. (Looking forward felt static and dead-eyed.) If you're ever figuring out pupil-placement, do what I do: cut out a circle of black paper and use a bit of double-stick tape to try out different locations. Suuuuper helpful. Time for more beauty shots! We've had torrential downpours here every day for about 6 weeks, so our backyard has this brilliant carpet of green on it. Doesn't make up for the fact that our whole state is a giant sauna, but at least it's a pretty photo backdrop. 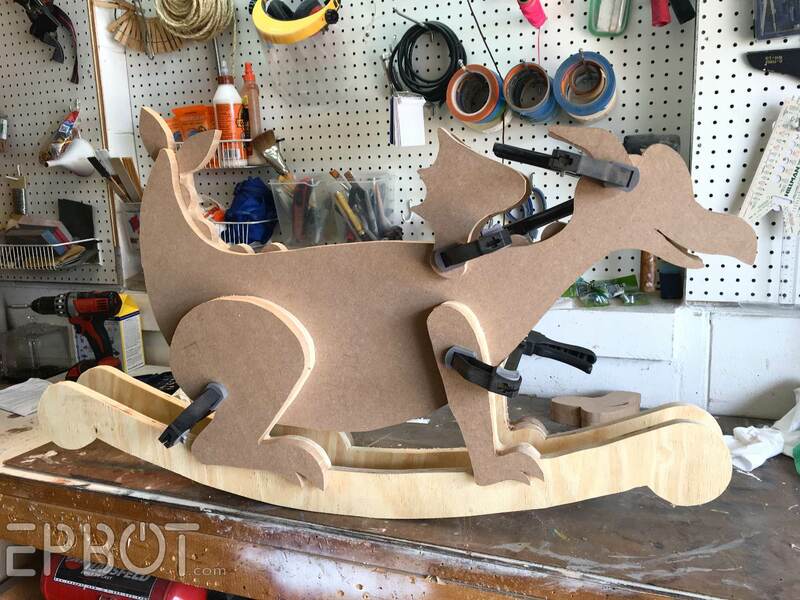 Everything is secured with both long wood screws and wood glue - right down to the horns - so it's as sturdy, heavy, and safe as we could make it. I really love the rainbow rails (Rainbow Tunnel homage, anyone? ), even though they added immeasurably to our painting pain. It's just so HAPPY, and gets me right in the childhood feelz. Of course, all that said, and after all this work: we're not keeping it. No, as with the AT-AT rocker, this was something we just wanted to see if we could do, and now we're ready to pass it on to a loving, Dizgeeky home. 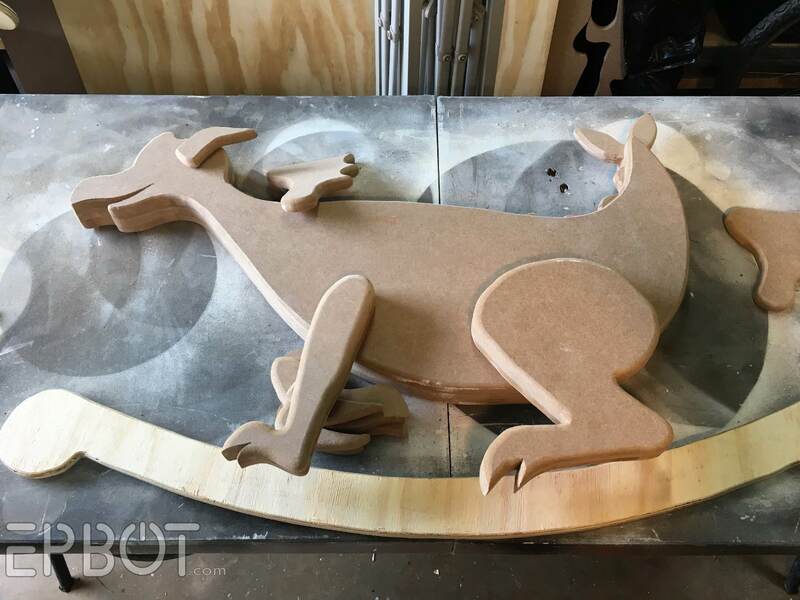 For those of you who want to make your own Figment rocker: we don't have a template ready (yet? ), but this IS an easier build than the AT-AT, so we're open to creating one. 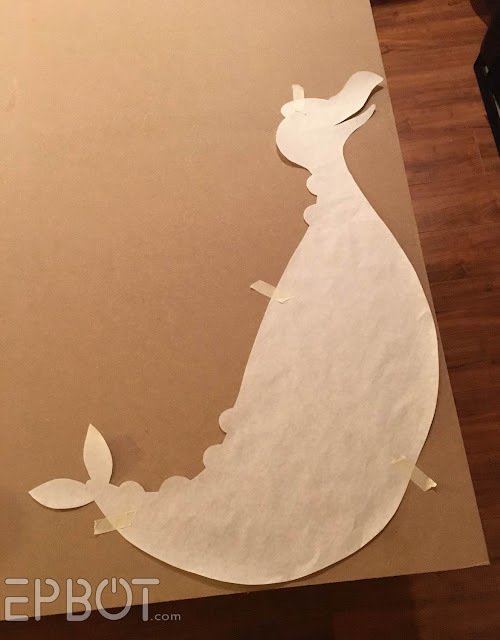 Let me know in the comments if you'd be interested, since it's a lot of work to put together the patterns and write out all the instructions, and I don't know if that many people are Figment fans. Then again, if we ever make another one, I think I'll paint it differently so it's less Vintage Epcot-specific. (We could also tweak the horns.) After all, there are lots of other fun dragon themes, from Harry Potter to The Hobbit to classic medieval times! With all that geeky potential, I feel like a more generic color-scheme might appeal to more folks. So what do you think? Worth it? UPDATE: Good news! We *did* make another one in a different colorway, and you can purchase the plans in our Etsy shop here. Thanks, gang! I love it!!! The fact that the colors are "Vintage Epcot-specific" is what makes it awesome. It's beautiful! Great job you two! This just made me smile the whole time reading it. It is so bright and cheerful! PLEASE make a template available - i NEED this for my Figment obsession! I even painted my office Figment purple! It is absolutely gorgeous - amazing job you guys! Wow. Just wow. The charity you've donated it to sounds wonderful! Ermergersh, THIS NEEDS TO HAPPEN. Internet, assemble! And then (please) share your pictures! The childless among us would love to bask in the major adorableness! 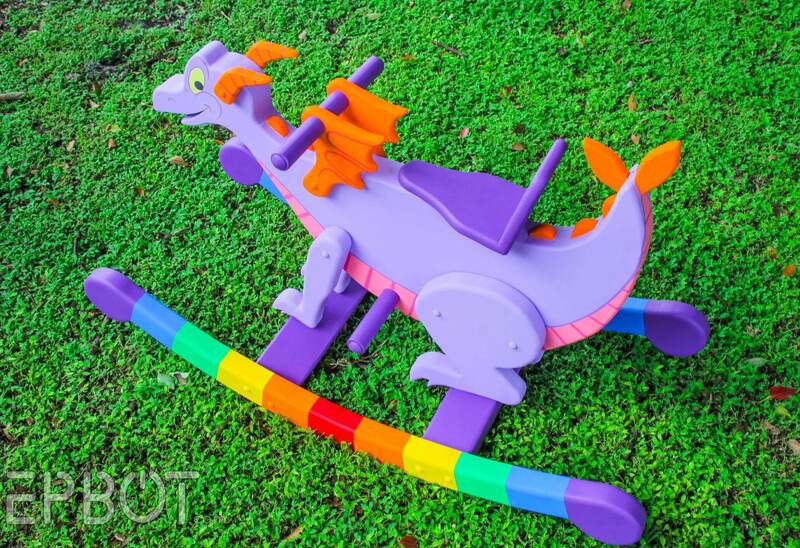 Somehow I only know Figment (and dreamfinder) from your blog, but a slightly more generic paint job would make this a marvellous dragon rocker for any family! I thought you were going to raffle it off. I so want it for my kidbot! LOVE it! I have to admit that I was disappointed that you didn't make it adult sized, because I totally want one that I can ride. But I am thrilled that the kids at Give Kids the World will be able to enjoy it! So beautiful, and what a lovely new home he'll have! oooh that would make an awesome maleficent (in dragon form) rocker too... great work as always, you two rock! AHA! How did I forget Maleficent?! Great idea! Why isn't there a like button! I NEED this! 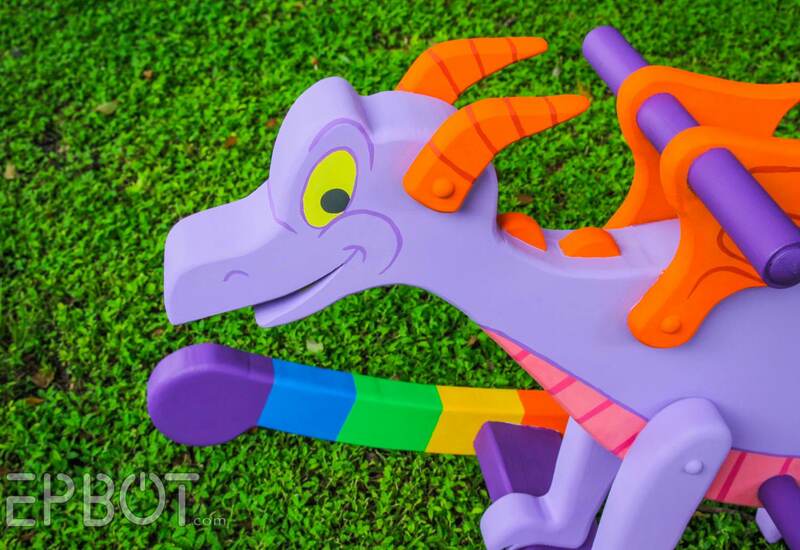 Also, I only know Figment from your blog, but I would LOVE a template! A "generic" dragon rocker would be amazing! This is so, so gorgeous. It just makes you happy to look at it! I love, love, love the idea of other dragon rockers from Harry Potter, etc. Wow. You guys could make SO much money making and selling these. 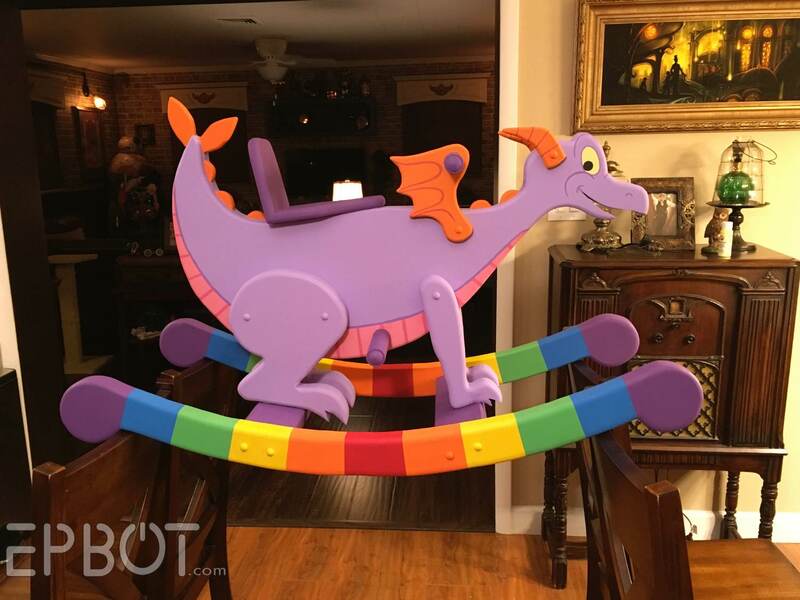 If I was in any way, shape, or form remotely this crafty I would be SUPER into making my own Figment. You did an AMAZING job!! I would totally (have my husband) build this for Baby Hulk!!! This is amazing!! 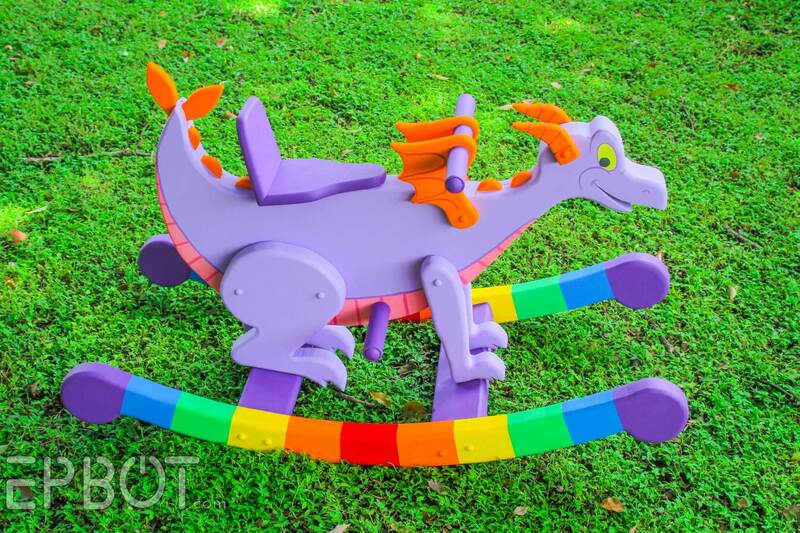 I grew up with Figment and would love to build this for my children, but alas my baby is 4 now. Maybe I could convince my husband to make it for the playroom for nieces and nephews to play with! 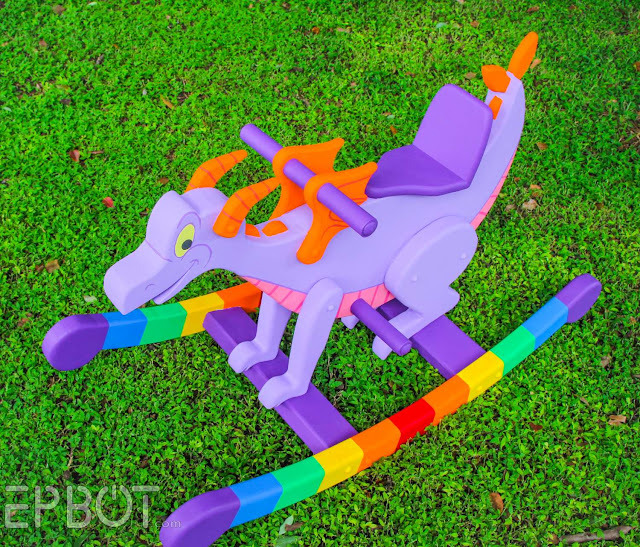 I love original Figment so much, this is just perfect! And I love that you did it just to see if you could and then donated it. Awesome on top of awesome. I'm happy crying so much. 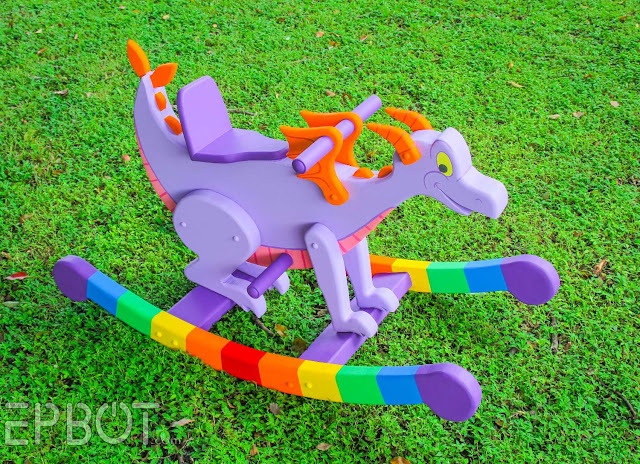 Figment is beautiful and I love knowing they'll be helping kids. You two are too wonderful for words. THAT IS AMAZING!!!!! Please make a pattern - I'll buy both and find someone talented to cut that bad boy out!!! It's amazing! I would love a template! ok Jen, I need need NEED! the plans for this, I am a huge dragon fan and I will beg the woodworkers in my life to make the rocker for me (I might be willing to gift it to my 4 month old niece.... maybe). if you do make the plans and list them for sale I will buy them in a heart beat. Oh my goodness, just when I think you guys can't top yourselves! This is ADORABLE. 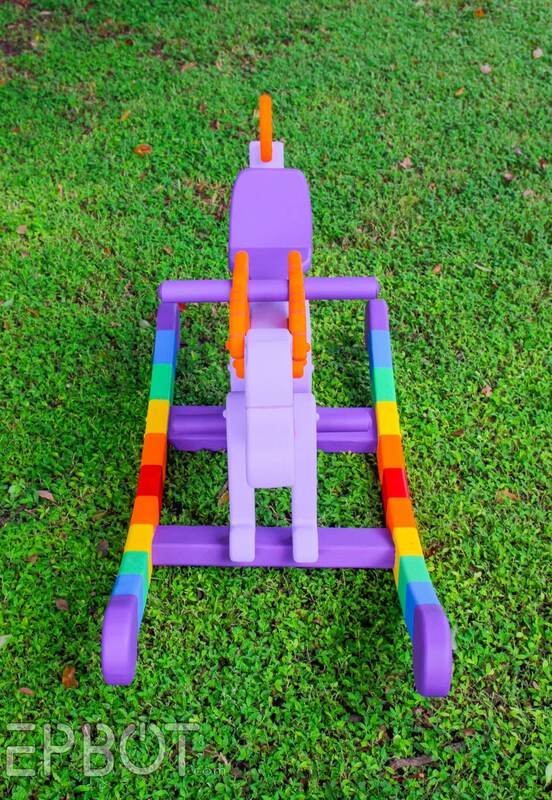 The rainbow rails are just the perfect touch. Is there anything y'all can't do? I'd love to see it as a pattern. It's amazing! Oooh, K-9 is SO going on the list. Maybe as a pull-along? So beautiful! And extra great that you're supporting such a good cause with it. This is so unbelievably epic, it almost makes me want kids. (Almost.) LOL Seriously though, it's AMAZING. And the fact you guys donated it to Give Kids the World is just awesome of you guys. I would die for this pattern. My husband and I are huge Epcot and Figment fans. 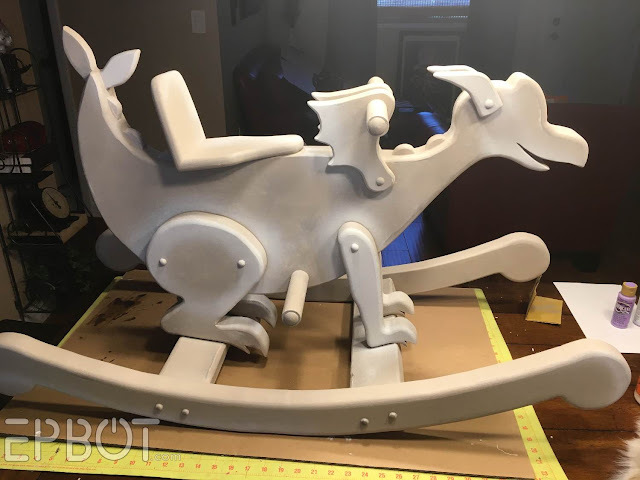 Oh my goodness, the AT-AT rocker was great, but this would fit our dragon theme nursery like nothing else! I'd totally be up for purchasing a template!!! Absolutely worth it! Beautiful job! This is brilliant! You two did an amazing job! I would love to see a K-9 or Toothless one. Getting it balanced for Toothless would be difficult since the best option is to have the wings open for effect. On that note Buckbeak would be another cool one. Keep buckbeak though he could be brought out at Christmas. Make one with a box instead of the seat and maybe the cats would like it. Great idea! I think this is a perfect template where you could create a few different center pieces with the same construction. I will buy this pattern & I think this would be an amazing 1st woodworking project. Another blogger I love did this with a sewing pattern. She made a base template, then she was able to make tweeks to create many different types of animals. I linked it (Not sure if it's allowed), but I thought it would be a fun idea & for a shop it's nice to have a few different options with the majority of the work only going in once. Is anybody else totally awed and gobsmacked that John was PAINTING THE RAILS RIGHT OVER THE BARE HARDWOOD FLOOR WITH NO PAINT CLOTH OR NEWSPAPER NOR NOTHING?!?? Earlier this summer I built a four-foot papier-mache "wooden shoe" (long story), and I was painting that puppy out on the grungy back porch with a week's worth of newspapers under and all around it, and I STILL managed to get paint on the surroundings :(. MASSIVE props to John for tidy paint skillz. That's a good point, Kimstu. We had some legal language like that for the AT-AT rocker auction, so it's a good idea to write something up for this donation, too. Thanks for the reminder! Super! And also!!! How about having the template include a few different variants for the head and the end of the tail, to give the dragon a more customizable "look" (because a Figment-shaped dragon head won't really look like Toothless's head even if painted black)? 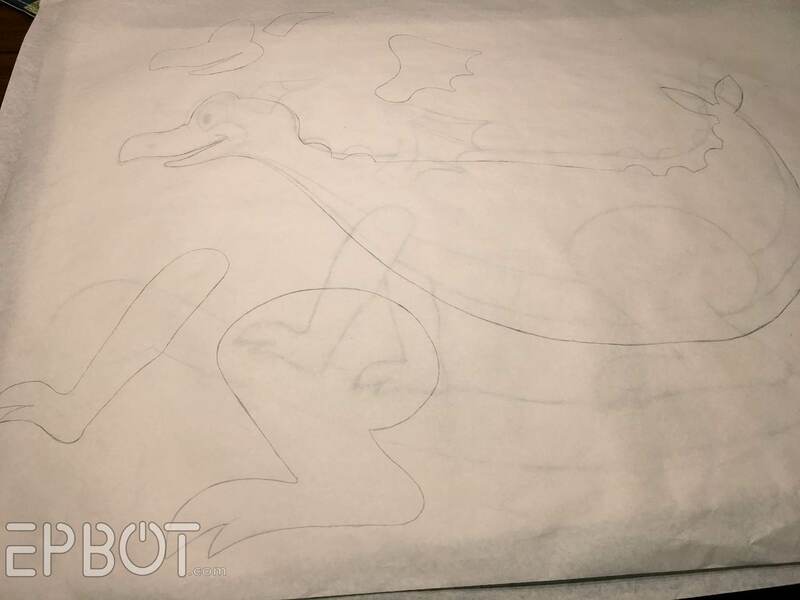 The basic body and limbs and vestigial wings would work fine for pretty much any dragon, but just cut off that main template at the neck and tail tip and have a few different head and tail-tip templates that could be mix-and-matched with it! Right?? The original Figment ones and Toothless ones and Hungarian Horntail ones and and and...!! OMG this is amazing and gorgeous!! Congrats again and that's so exciting about the charity! When you asked for other potential dragon interests my first thought was Toothless!!! Our 3yo daughter is obsessed and would love a Toothless rocker to go with the plush Toothless she "rides" and snuggles that's bigger than her! Lol. We'd pay for plans for that for sure!! I would also love to have the template, please. Thanks! I am interested in plans. 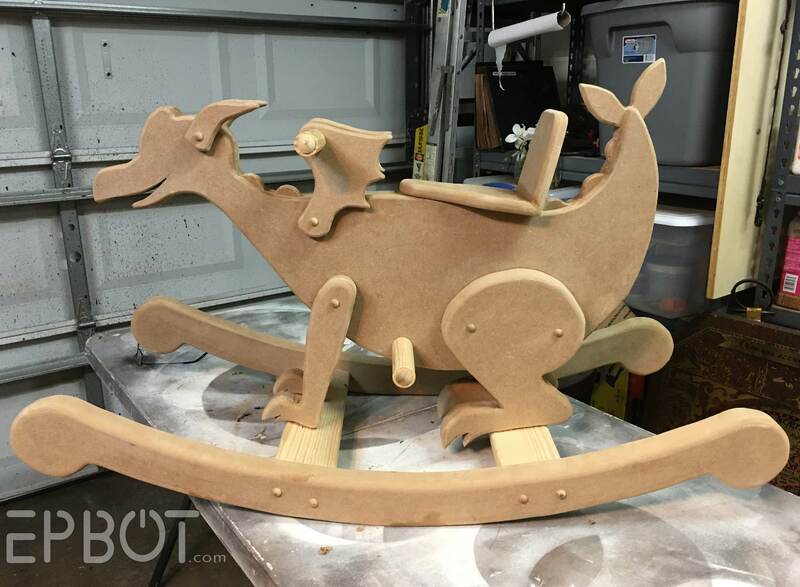 My daughter is figment crazy and would love to build one for a future grandchild. Give Kids the World is an amazing charity - what a great home for your work! Good job and thank you for sharing! Wonderful! 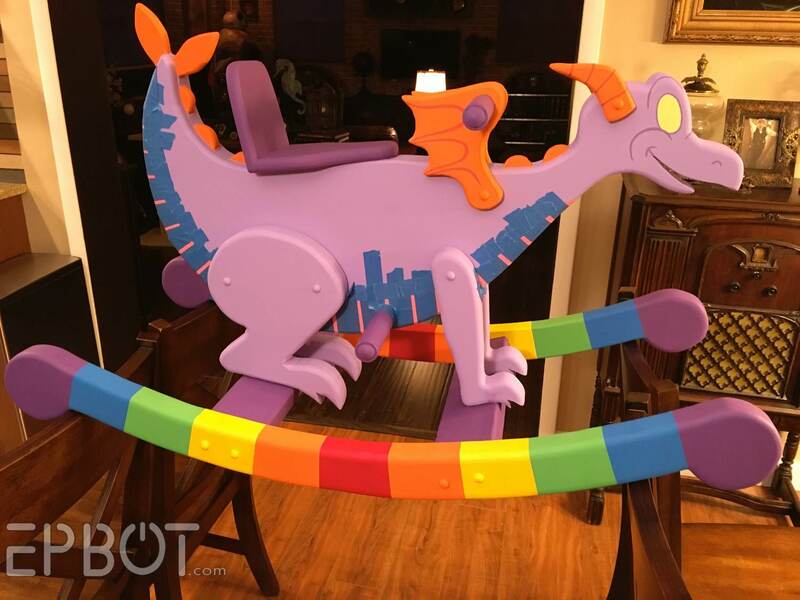 My only disappointment was realizing that this was kid-sized and not for you and John -- I was just waiting for that picture of John dressed up on the rocking Figment. Totally love this!!! Yes, please! Do make the plans available! And now I am sitting at my desk at work and can't stop humming "Puff, the Magic Dragon". I would be very interested in a pattern. I must admit I would paint it more generic, but it would be awesome! This is adorable and would love to have a pattern! Random question for you, where did you get your projector? I've thought about getting one for stuff like this but I can't find one that has decent reviews (Most of the ones I've seen mention in the reviews that they're blurry and don't enlarge that well). I would build a rocking Dragon. 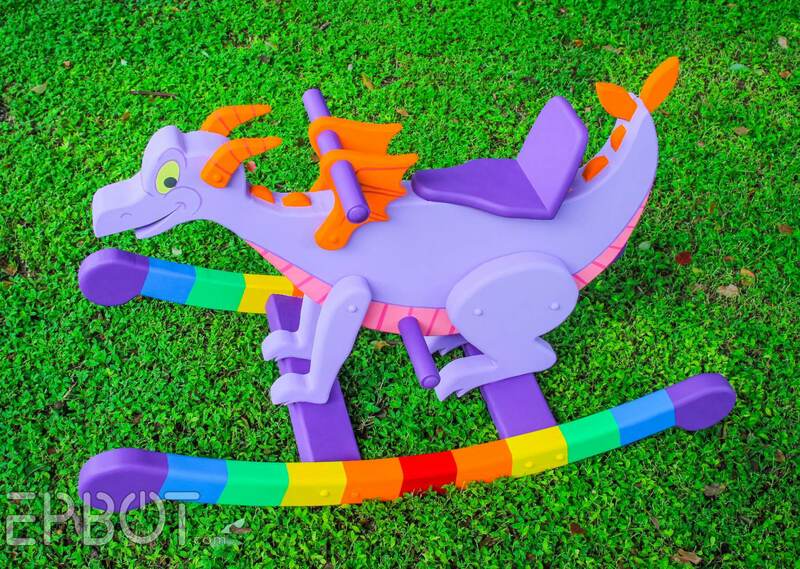 I don't know if it would be Figment or not, but I do love me a dragon of any kind!! Love love love this. I didn't realize Figment and DreamFinder were just EPCOT inhabitants, and not Disney. As a West Coaster, it's no wonder I'd never heard of them before I started reading your blog. I thought maybe they were something that came and went in the (many) years between my visits. I loved dragons, though, so this is amazing - and how wonderful that it's going where children will love it and dream. I'd also like to add: eeeeeeeeee! This is darling. I didn't really grow up with Figment. (I probably encountered him when I was very young and going on trips to Disney with my Winter Park-inhabiting grandparents, but I was too young to remember.) But how can you not love an adorable little dragon with rainbow rails? And I was getting through your piece just fine until you mentioned where Figment's new home will be, and then the waterworks started. Someone I know (not well--her mother and mine used to be best friends, so we played together as children) has been adjusting to a particularly horrible diagnosis for her younger daughter. She has a degenerative disorder called Batten's disease, which at this point (obviously hoping for a cure!) is 100% fatal. Post-diagnosis, Make A Wish and Give Kids the World worked incredibly fast to provide their family (all of whom are obviously quite affected by the diagnosis) an extraordinary experience that allowed those two little girls (the disease is pretty rough on siblings, too, obviously, and there was an extended period when they didn't know whether or not the older daughter might also have the disorder--she doesn't, thankfully) to just be kids in the midst of a truly difficult time in their lives. This is so cute! I always suspect when there is Epbot radio silence for a while, that you guys are gonna drop a sweet project on us. And you don't disappoint! Does he come in adult size? ;) You guys are SO talented! Figgie is awesomatious!!! I had heard of Give Kids The World but hadn't actually gone and looked up their site. Wow. They look incredible, and now I know another place to donate to! An Elliott from 'Pete's Dragon' version would work too! Yet another fabulous project from the multi-talented Jen and John. 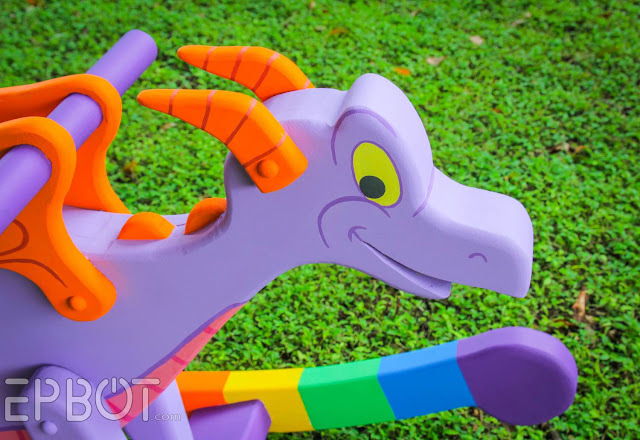 Figment is beyond adorable. I just wish it came in adult sizes! 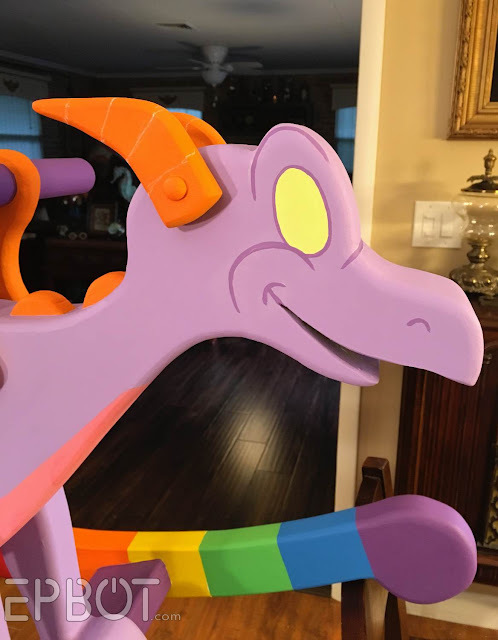 I'm not really familiar with Figment at all, but that this is freaking adorable, and there's no reason it couldn't be adapted into any other dragon one wanted. If I had any need for a dragon rocker, this would totally be my first stop! When my friends' daughter passed away from an accident, we found GKTW. When I go down to Orlando, I'll take a day or two to volunteer. It's an amazing place. THIS IS SO GREAT AND I HAVE ALL THE HAPPY FEELS! thank you for sharing your work. you make a difference in so many lives. 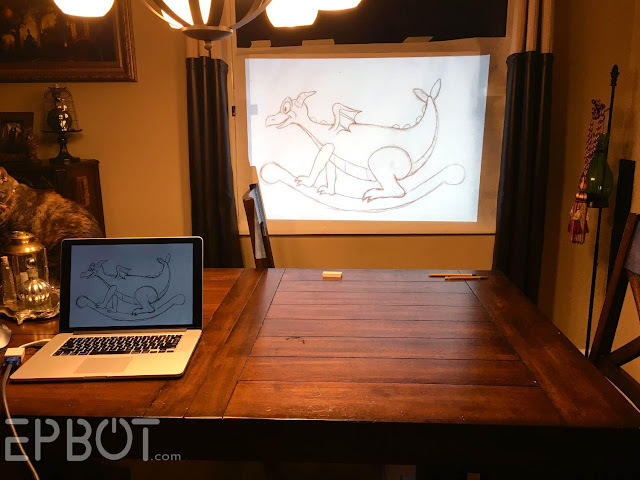 I love this and would love to try a project like this with a more generic dragon. My son was born with Dwarfism, he's almost one and half but when he's a little older I'd love to make him a rocker as most standard rockers are too tall for him and the pegs are in the wrong spot. Did y'all seal the paint with clear coat or anything? I would LOVE to purchase the pattern!!! Please make it available!! THIS IS AMAZING! The tattoo of Figment on my shoulder is dancing with joy. omg yes please for the template. 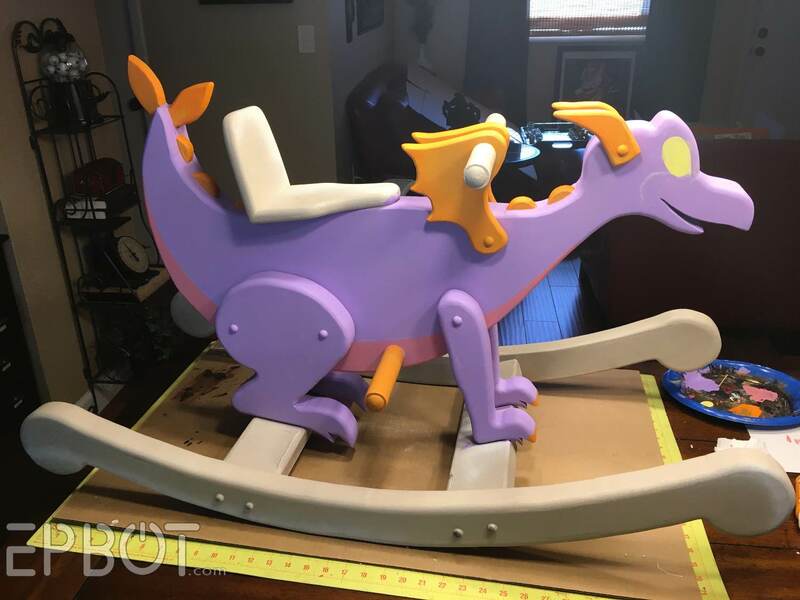 I loved your first rocker but had no excuse to make one, but I have one now and Figment is my all time favorite anything. Excellent work! You guys are amazing! I'm particularly impressed with John's "Michelangelo painting the Sistine Chapel" pose. Please, oh please make this a pattern! I'd love to make a 'Toothless' one! It's all in the paint job and facial details. This looks gorgeous. I'm going to attempt this in the very near future for my godchild. A template would be amazing. I would love to know if a pattern or plans have been made available!! This is exactly what I've been looking for to make for a friends new baby! Yes, the pattern is in our Etsy shop if you'd like one! Click the AT-AT link in the right sidebar to get there.